A pina colada on the rocks cocktail made from fresh muddled pineapple, cold pressed pineapple juice (or at least pineapple juice not from concentrate), and coconut cream. Not to sweet, deliciously creamy and tropical. Nectar of the gods. Made from sugar. Makes you smarter, better at everything, makes others seem more attractive. With that raving endorsement, don’t you want some too?! Debbie prefers white rum. I prefer the dark. Its all a matter of preference. White rum has a lighter flavor and its great for mixing with cocktails if you want to taste more of the fruit. Not everyone loves the flavor of rum… Dark rum has a deep dark flavor, like dark brown sugar, and it really stands out in pretty much anything you mix it with. Its even better when you sip it on the rocks… My two favorites (so far) are Mount Gay from Barbados and Appleton’s from Jamaica. Caribbean Rum is where its at! You may have noticed that we chose to drink our piña colada on the rocks out of a pineapple. Well why not? Sometimes you have to just live in the moment and at that moment it was bright, sunny, and warm outside on my deck. We sat outside in that dazzling sunshine, faces turned to the light, sunglasses on, jackets off and channeled our summertime selves while we drank our piña colada, threw the ball for our puppies, and sent selfies to Mark and my sister Sam because they thought we were working hard on the blog and sent us selfies of them having a drink in the sun to make us jealous. Like we would let that sunny day pass without being in it for a while if at all possible. Do they even know us?! 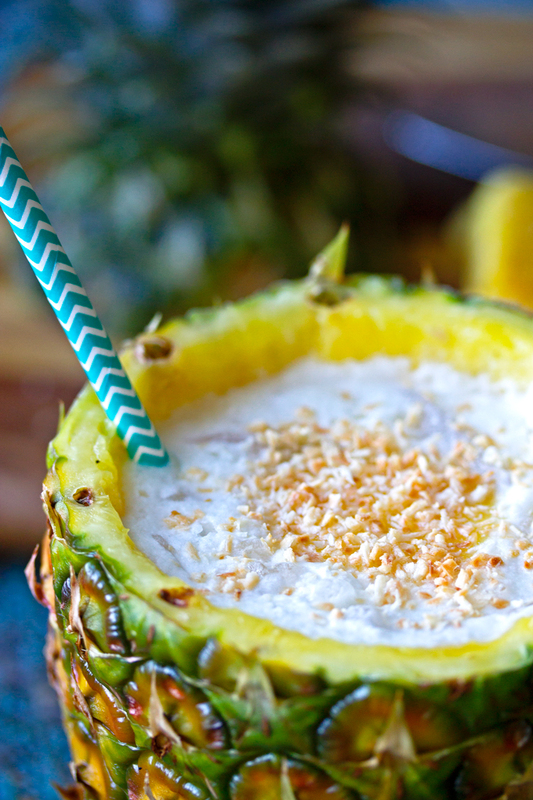 Our piña colada on the rocks is made from fresh muddled pineapple, cold pressed pineapple juice, and coconut cream. If you cant find cold pressed juice, at least use the good pineapple juice that comes in a jar and is not from concentrate. 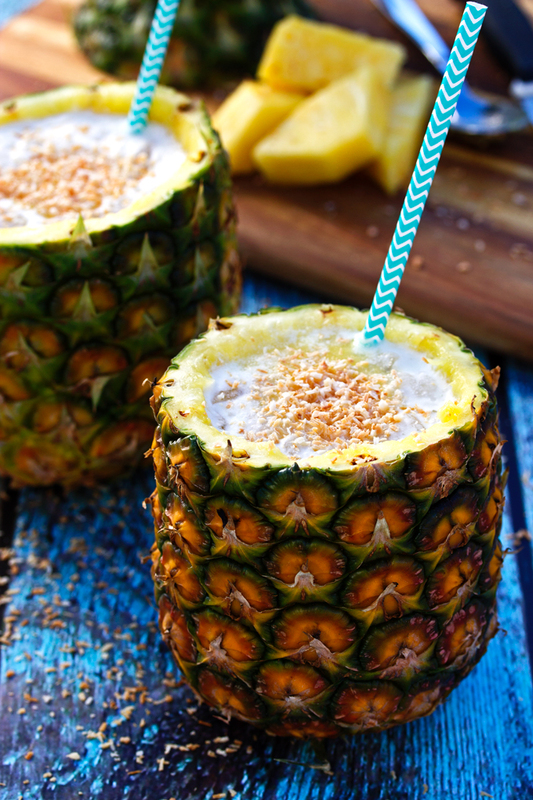 Debbie and I usually don’t really like piña coladas just because they are too sweet and they don’t even taste like pineapple and coconut, they just taste sugary. This one has no added sugar at all. Its brilliant. Kevin and I drank a few piña coladas in Curaco last December. The hotel we were at had a little hut on the beach that mixed up drinks for sunbathers and we took full advantage. Our last moments in Curacao were spent on the beach, soaking in as much sunshine as we could, and drinking a piña colada. They were the first ones that I liked in a long time, and even though they came from a mix in a carton, the ingredient list (yes I had to look!) was pineapple juice, coconut cream, and cane sugar. Basically. But it gave me the idea to try to make one at home with unprocessed ingredients. 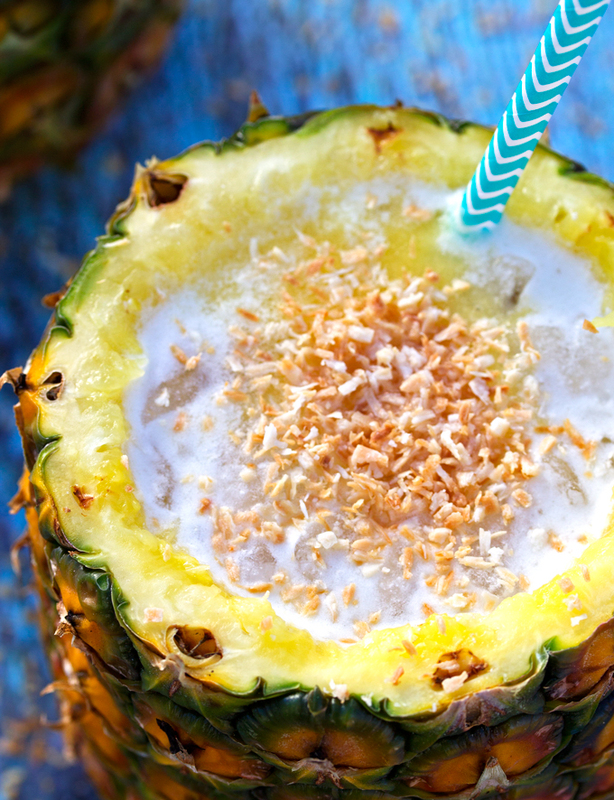 Traditional piña coladas are made with blended ice but we made this one on the rocks instead. For one, then you don’t need a blender to whip one up, but also because we find that the blended ice actually waters down the juice and it doesn’t taste as good. So its not slushy, but it is light, frothy and amazingly fresh. We topped ours with toasted coconut. Debbie’s genius idea! So good. SO so good… Especially when you get to the bottom. Our pina colada on the rocks and in a pineapple may have inspired you to have one of your own. And if that’s the case, I need to tell you the best way to carve out your pineapple for your cocktail. With a sharp knife you simply cut around the edge of the pineapple leaving about 1/2 an inch of flesh all the way around. Be careful not to cut all the way to the bottom! Then cut around the outside of the core as well. Next, cut all the way through the big circle that you cut out first both ways like you are making an X through the center of the pineapple. The inside flesh should scoop out pretty easily with a spoon then. Once that’s done only the core should be left and you can easily cut that out once all the fruit has been scooped out. Easy peasy. Then you can use the scooped out fruit to make your cocktail! Your going to love this one! Pina colada is no doubt my favorite cocktail! 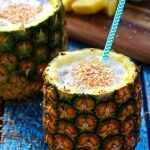 It is awesome that your version is made from with fresh pineapples. They look stunning! Can’t wait to try! Great post – I will be making these this weekend! Also, I am looking at planning a trip to Curaçao and just was wondering what beach bar you were referring to? Oh fun! You will love Curacao, I’m sure. The beach bar I was referring to was at our hotel, the Santa Barbara Beach & Golf Resort, however I don’t recommend staying there as it is quite far from town (about a 15 min drive) and there is not a whole lot to do there if you don’t golf. But if quiet is what your after, then its a gorgeous hotel. If you have more questions about Curacao, I would be happy to talk Curacao with you! Just send me an email. OMG!!!! !this coktail is so good!I will make thoes every weekend. Thank you so much! So happy to hear how much you like the cocktail, Julianna!